2013 would have been a great year in the stock market if I were retired. Unfortunately, I’m paying higher prices for the stocks I continue to add to my portfolio. However you look at it, 2013 was a roaring year for the stock market. My overall internal rate of return (IRR) was 26.74%. So how does this compare to a benchmark return? My portfolio is almost completely indexed; the only exception is that I still own some Berkshire Hathaway stock. I chose the Vanguard ETF of U.S. value stocks (ticker: VTV) as an appropriate benchmark for Berkshire. If I had invested in VTV instead of Berkshire, my 2013 IRR would have been 25.92%. My compound average alpha over this 19-year period is 3.59% per year. Some may wonder why I would give up stock picking in favour of indexing. After all, at this pace it would take me only 20 years to build a portfolio double the size that the index would give me. The answer lies in the 1999 results. My spectacular 192% return in 1999 was a wild ride taking insane risks that happened to pay off. If we leave out 1999, my compound average alpha drops to a loss of 1.10% per year. Focusing on the years where I was most serious about studying stocks (2000-2008), my alpha was a loss of 4.75% per year. I don’t believe I have any stock-picking skill. 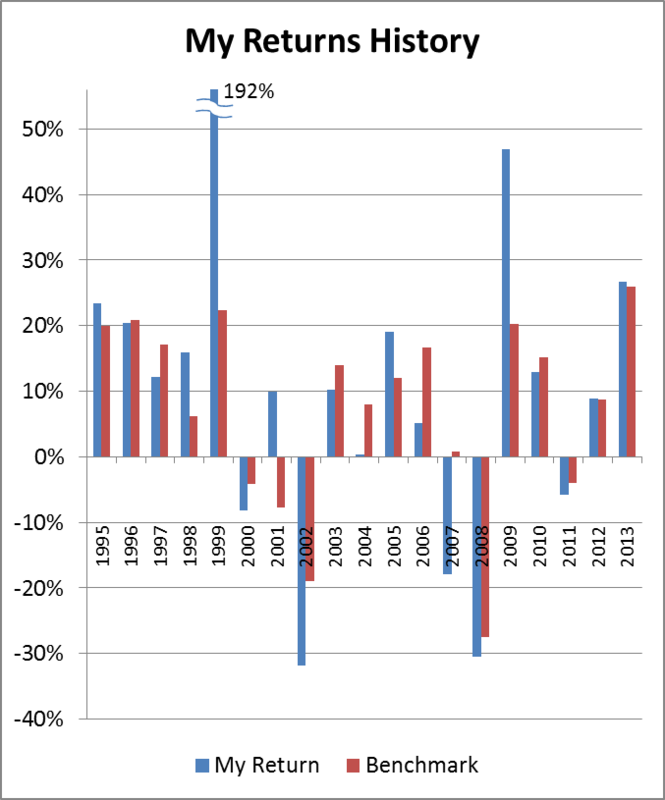 My chart above shows nominal returns (no adjustment for inflation). Investors should think in terms of real returns where we subtract out the effect of inflation. What matters is how your purchasing power changes, not how your number of dollars changes. My compound average real return is 8.42% per year. If this were sustainable, I would be far past the point of financial independence for my family. However, if we drop out 1999, my compound average real return drops to 2.73%. So, I continue to work not only because I enjoy what I do, but because I have a lot of mouths to feed. I’m still very comfortable with my decision to become a mostly index investor. I expect that I’ll eventually sell off the Berkshire stock and go 100% with indexing. I’m also hopeful that my mix of Canadian, U.S., and international stocks will generate at least a compound average 4% real return over the next 25 years. We shall see. 1 Some readers will know that CAPM defines alpha in terms of risk-adjusted return rather than a simple comparison to a benchmark. I’m using “alpha” in the simpler (but related) sense here. Others will notice that subtracting the benchmark return (25.92%) from my return (26.74%) gives 0.82%, not 0.66%. This is not the right way to take a percentage difference in this case. To get the added return that would compound with 25.92% to give 26.74%, we compute (1+0.2674)/(1+0.2592)-1=0.66%. Cool, great results and excellent tracking & accounting. More people should do all this! Without getting to personal, curious as to your high results. The US Index was up about 33% on the year, or more if adjusted for CAD currency. EAFE index did similarly well. But Canada index was up only about, what, 10-11%? Emerging index was basically flat. Bonds, REITs, all flat or down. So to get those results, you must have a very heaving weighting toward US and EAFE markets? @Anonymous: Thanks. I think stock pickers definitely need to do this, but it's work and many probably don't want to find out that they stink at picking stocks. I have no bonds or real estate (beyond houses for my family), and my allocation to Canadian stocks is less than half. Did you manage that cut for the 192% point in Excel, or was it photoshopped? @Potato: I used the drawing tools within Excel. I just used three wavy lines (the middle one is thicker and white) and a text block.